The English common law the king merely replaced God with himself. Deodand traces back to the 11th century in England and was applied by the king to confiscate assets until Parliament finally abolished it in 1846. Nevertheless, under this law, a chattel (i.e. personal property) was considered a deodand whenever a coroner’s jury decided that the property had caused the death of a human being. In theory, deodands were forfeit to the king who was supposed to sell the chattel and then apply the profits to some pious use. Of course, once any government gets its hands on money – just forget it – it is their’s. Effectively, a jury decided that a particular animal or object was a deodand and then appraised its value and the owners were expected to pay a fine equal to the value of the deodand. If the owner could not pay the deodand, his township was held responsible. 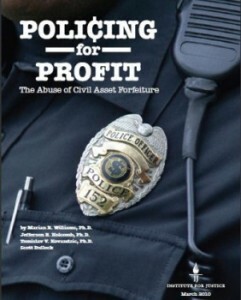 Today, civil asset forfeiture has been so abused by the US government it amounts to outright theft. People cannot afford costly lawyers and the government exploits the poor all the time to just confiscate cash, cars, and houses. The police are using it just as the troops in Rome turned against the people to pay for their salaries. The police have been transformed into the enemies of the people for whatever they can confiscate they just get to keep.